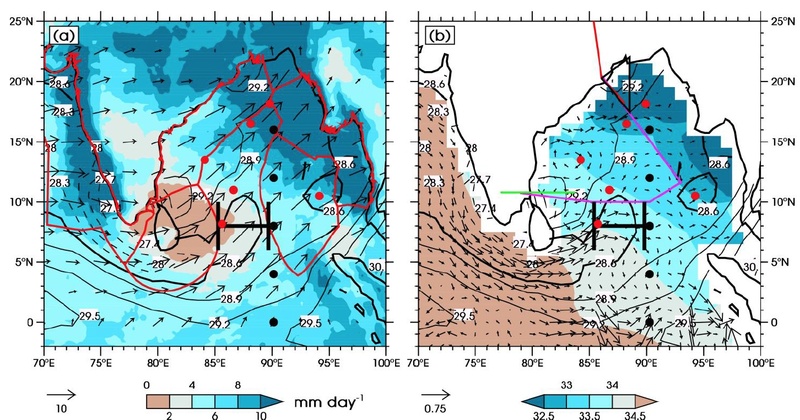 Climate-relevant Ocean Measurements and Processes on the Antarctic continental Shelf and Slope. An Alternative Framework to Assess Marine Ecosystem Functioning in Shelf Seas. We aim to better understand the drivers in oxygen depletion UK Shelf seas, focusing on the North Sea by carrying out a sustained AUV sampling program which has never been done before. Over three years AlterEco will deploy small fleets of submarine and ocean surface robots. This will be combined with ongoing North Sea science observational programmes to provide atmosphere-through-ocean coverage of physical conditions and forcing across the sea at scales from 100s of kilometres to less than one kilometre. 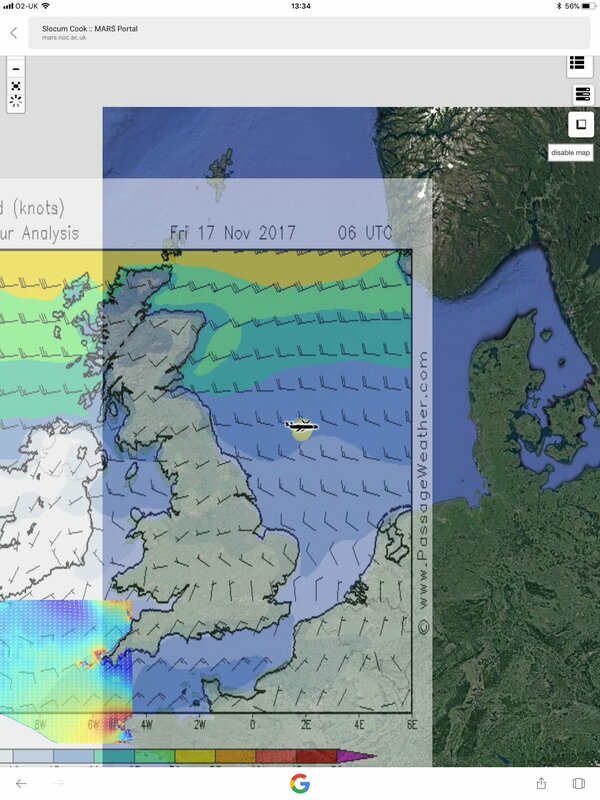 This technology will help UK scientists to better define the priority parameters to measure, improve methods of data analysis and enhance understanding of the monitoring necessary for shelf-sea-wide ecosystem health. To develop a novel monitoring framework to deliver improved spatial and temporal understanding of key shelf sea drivers for investigation of the shelf sea ecosystem functioning. The Bay of Bengal Boundary Layer Experiment is a UK-India collaboration to investigate Indian Monsoon processes in the Bay of Bengal. Over a billion people depend on the Indian Monsoon for subsistence. Too much or too little can be disastrous, but better predictions mitigate these risks. The storm systems that provide the rainfall for much of northern India get their moisture and energy from the warm surface water of the Bay of Bengal. We aim to better understand how heat and salt is transported from the Arabian Sea, how this water mixes with the freshwater from the river input in the northern Bay of Bengal, and how these processes influence the monsoon. We will use a combination of ships, robotic submarines and satellite data to observe ocean processes at higher resolution than has been achieved during the monsoon. Computer simulations will assess the impact of these processes on monsoon rainfall. Since there are political sensitivities in the Sea of Oman and the Arabian Sea, as well as dangers from piracy and hijacking, ship-based campaigns are problematic. Therefore the aim of this project is to explore how our proven expertise in scientific observational campaigns using autonomous underwater vehicles (AUVs), specifically ocean gliders, can best be transferred to this exciting and challenging region. AUVs offer great potential as a research and management tool in such sensitive oceans, because they are relatively cheap (so not worth taking for ransom), they are unmanned (so do not put personnel at risk), they spend relatively little time at the surface (so are not usually detectable) and they transmit their data back at each surfacing through satellite communications (so in the event of loss of the vehicle, the data are still safe). The northwestern Indian Ocean (Arabian Sea, Arabian Gulf) is a fascinating place that plays an important role in the global ocean ecosystem. The winds completely change direction from one season to the next; this is called the monsoon system. During half the year, the winds blow from the southwest. Because of the rotation of the Earth, a wind from this direction moves the water away from the coast of Oman. This brings up deep cold water from below the ocean surface, which is often associated with rapid growth (called blooms) of ocean plant life called algae. This upwelled water is cold, but most importantly, it is very low in the amount of oxygen gas dissolved in the water. This is important, because fish cannot survive in low oxygen water. Sometimes the algal blooms are toxic. But scientists really don't yet understand the way in which the water becomes low in oxygen in the first place, or why the blooms happen when and where they do. This project hopes to shed light on these issues. These are important questions for the management of the Arabian Sea, and also for the people of Oman. Toxic algal blooms and fish kill events damage the local fishing industry and the food source for the population, and can cause death in the local population through contamination of food. One reason that progress on these scientific questions has stalled is that the Arabian Sea is troubled by piracy. Large international research ships are not able to go there. So we have to be more imaginative. One possible solution is to use autonomous underwater vehicles called ocean gliders to make the measurements we would normally make from ships. The gliders are piloted remotely by scientists using their computers and satellite communication. They spend most of their time underwater like a submarine, so people won't know they're there. The gliders send their data back in real time too, so even if the pirates did decide to steal the glider, we would still have the data. This project will bring together, for the first time, scientists from the UK and from Oman, to explore how we can best use this state-of-the-art technology to address these questions regarding the ocean processes off the coast of Oman. This requires a multi-disciplinary approach; the gliders will be measuring the physical, chemical and biological properties of the water. 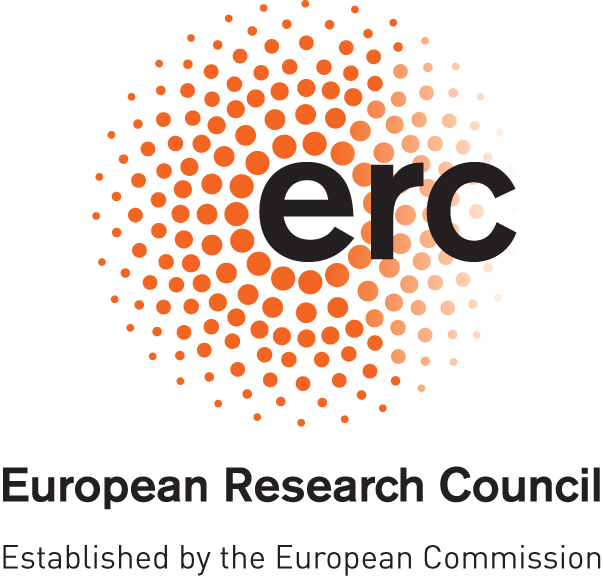 This project will pool the expertise of both sets of scientists, to design a trial, carry out a short deployment of a glider in the region, and analyse the results. The lessons learned from the trial will help us to plan a more ambitious field programme, as a joint UK-Oman contribution to a big international campaign in the latter half of this decade to move forward our scientific understanding of the Indian Ocean. GENTOO stands for Gliders: Excellent New Tools for Observing the Ocean. As well as the name of one of our favorite penguins, the project title emphasizes the compelling prospect of using ocean gliders to continously monitor remote but influential regions of the ocean, like the Weddell Sea. Data collected by our gliders will provide us with an exciting new view of the variability and inter-dependence of ocean physics, chemistry and biology at the boundary between the Antarctic margins and the global ocean. We all love the idea of having a robot to do our bidding. Scientists are realising that robot technology now offers exciting possibilities to observe our environment in ways we have only dreamt of. We will use a fleet of three robots roaming the ocean near Antarctica to answer science questions that are critical to our ability to predict and manage the ocean and its living resources in an era of unprecedented change. The robots we will use are called ocean gliders. Much like the familiar airborne gliders, they do not have a propeller. Batteries drive a pump to move fluid between one area within the glider and another outside its hull, thus changing whether the glider is denser than seawater, so it sinks, or less dense than seawater, so it rises to the sea surface. It glides up and down, communicating via mobile phone with the scientists controlling it each time it comes to the surface. Oil prices have risen sharply in recent years, and ships use a great deal of oil. Using gliders as part of our future ocean and climate observing systems will save tax-payers’ money since some ocean observations can be done much more efficiently by remotely controlled gliders. Gliders can also observe the ocean when we’d really rather not be there with ships, such as in winter or in strong winds and heavy seas. This project plans to show that these possibilities are within our grasp. Dense cold water sinks around the continent of Antarctica when cold wind blows over the water and helps sea ice to form. We’ve known for nearly 100 years that this happens in the southern Weddell Sea. We think that this might now be happening in a new region, because of the recent collapse of the Larsen Ice Shelf. 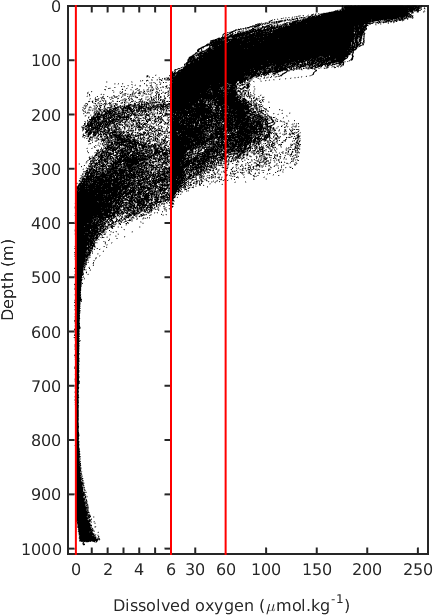 Our gliders will measure the amount of dense water spilling off the continental shelf. This is important because climate models suggest that the amount and properties of this dense water are likely to impact on the global ocean overturning circulation that controls our climate; we need to know if these are changing. This dense water spilling over the continental slope probably also affects where the ocean currents are. So these currents might be moving further onshore or offshore, as the dense water changes. We’ll try to measure and understand this. 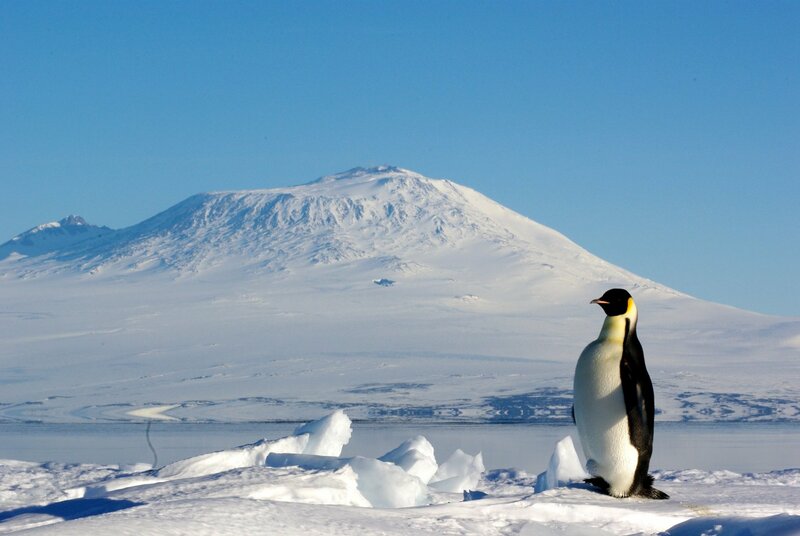 These changes in the ocean currents also affect the animals living in the waters near Antarctica. Antarctic krill are shrimp-like creatures that form the prey for animals such as whales, seals and penguins, not to mention underpinning a multi-million pound krill fishing industry (ever had a krill pizza?). Krill lay their eggs around the Antarctic Peninsula, and are then carried across the Scotia Sea to South Georgia by the ocean currents. Whilst the west Antarctic Peninsula is well surveyed, we don’t know how many krill are in the Weddell Sea, on the eastern side of the Peninsula, possibly spending the winter under sea ice. Might the changes in ocean current affect whether these krill reach South Georgia? If we can establish that the krill are surviving under the ice and could travel to South Georgia, it may be that marine mammals and the krill fishing industry will be less vulnerable to climate change than we have feared. In which case, krill may become a more important food resource for us humans too in an uncertain future; you never know, the krill pizza may find its way to your local supermarket before long! Glider Observations of Variability in the Ross Sea was an NSF funded project led by Prof. Walker Smith in 2010/2011 aiming to investigate the spatial and temporal variability of the mechanisms which fuelled the bloom in the Ross Sea polynya. Antarctic Science Ltd. provided additional funding to allow me to deploy another glider alongside theirs to obtain concurrent observations of physical, chemical and biological properties along Ross Bank. Hydrographic observations of oxygen and related physical variables in the North Sea and Western Ross Sea Polynya. Investigations using Seagliders, historical observations and numerical modelling. Coastal shelf seas are one of the most ecologically and economically important ecosystems of the planet. Dissolved oxygen in particular is of critical importance to maintaining a healthy and stable biological community. This work investigates the physical, chemical and biological drivers of summer oxygen variability in the North Sea (Europe) and Ross Sea polynya (Antarctica). In particular, this work also focuses on the use of new autonomous underwater vehicles, Seagliders, for oceanographic observations of fine scale (a few metres) to mesoscale features (hundreds of kilometres). Two hydrographic surveys in 2010 and 2011 and an analysis of historical data dating back to 1902 revealed low dissolved oxygen in the bottom mixed layer of the central North Sea. We deployed a Seaglider in a region of known low oxygen during August 2011 to investigate the processes regulating supply and consumption of dissolved oxygen below the pycnocline. Historical data highlighted an increase in seasonal oxygen depletion and a warming over the past 20 years. Regions showing sub-saturation oxygen concentrations were identified in the central and northern North Sea post-1990 where previously no depletion was identified. Low dissolved oxygen was apparent in regions characterised by low advection, high stratification, elevated organic matter production from the spring bloom and a deep chlorophyll maximum. The constant consumption of oxygen for the remineralisation of the matter exported below the thermocline exceeded the supply from horizontal advection or vertical diffusion. 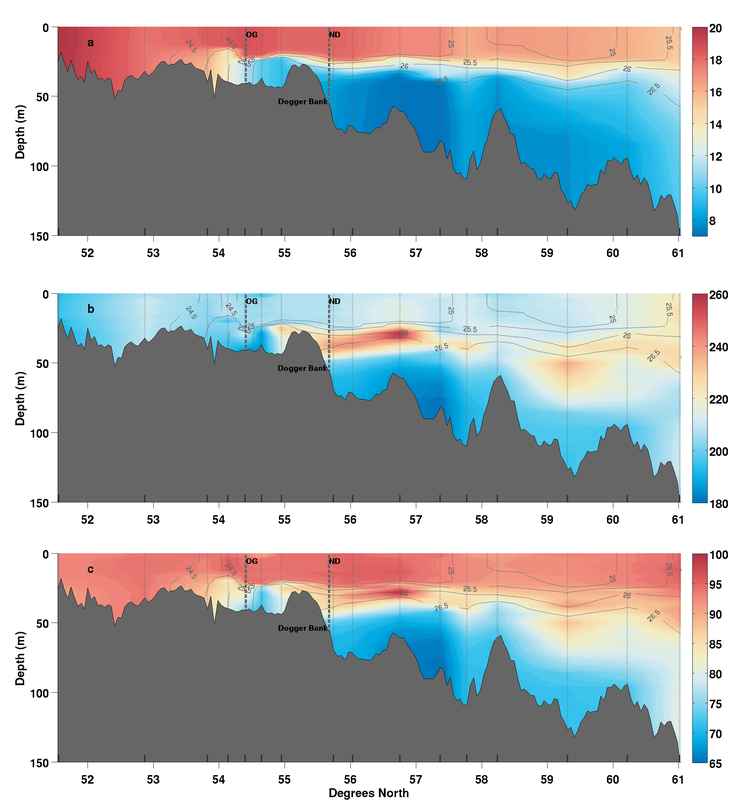 The Seaglider identified cross-pycnocline mixing features responsible for re-oxygenation of the bottom mixed layer not currently resolved by models of the North Sea. Using the data, we were also able to constrain the relative importance of different sources of organic matter leading to oxygen consumption. From November 2010 to February 2011, two Seagliders were deployed in the Ross polynya to observe the initiation and evolution of the spring bloom. Seagliders were a novel and effective tool to bypass the sampling difficulties at a fraction of the cost and inconvenience. The gliders were able to obtain data in the polynya before access was possible by oceanographic vessels. We present observations of a large phytoplankton bloom in the Ross Sea polynya, export of organic matter and related fluctuations in dissolved oxygen concentrations. The bloom was found to be widespread and unrelated to the presence of Ross Bank. Increased fluorescence was identified through the use of Ocean Colour data and is likely related to the intrusion of modified circumpolar deep water. 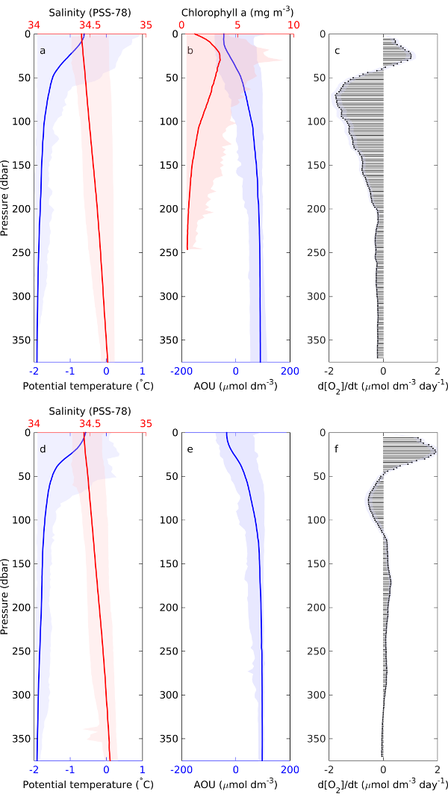 In parallel, changes in dissolved oxygen concentration are quantified and highlight the importance of a deep chlorophyll maximum as a driver of primary production in the Ross Sea polynya. Both the variability of the biological features and the inherent difficulties in observing these features using other means is highlighted by the Seagliders. The Seaglider proved to be an excellent tool for monitoring shelf sea processes despite challenges to Seaglider deployments posed by the high tidal velocities, shallow bathymetry and lack of accurate means of calibration. Data collected show great potential for improving biogeochemical models by providing means to obtain novel oceanographic observations along and across a range of scales.